Louth CC Second XI staved off Saturday’s storms, but fell agonisingly short of victory in the Lincs County League against Broughton. On a day where the changeable weather was expected to play its part, Broughton won the toss and elected to bat on a firm surface. Opening bowlers Sandy and Ahmed kept things very tight and gave the batsmen nothing to hit. Both openers were soon out, lbw, with the score on 20, but Blackburn and Fish rebuilt, playing against their natural attacking instincts to compile a stand of 73. This was finally broken by B. Wright who had Fish caught at cover by Medler, and Ahmed soon picked up his second wicket by bowling Clark. Runs were still hard to come by as the wickets fell steadily with West claiming what could be his final Louth wicket, courtesy of a world-class catch by Ahmed on the boundary rope as Broughton closed on 198-7. Louth felt this was a very reachable target, but with the ever-growing threat of rain they knew a good start was needed. The score reached 21 when Medler was bowled by a sharp yorker which snapped the stump in the process. Jacklin joined West and looked to be positive, but the remaining opener was caught behind off a short ball by Clark for a well-made 20. The rain became heavier after this wicket and forced the players off for a sustained period. When they returned the game had become a timed game, meaning Broughton had an hour or 20 overs, whichever came first. This left Louth needing another 140 runs in the time allocated, and Garlick set about hitting the bowling around the ground, making a quick 42 before he was bowled. Harvey was promoted up the order to keep up with the rate and rapidly hit 13 before he was caught behind. Joined by skipper S. Wright, Jacklin played nicely, but was caught trying to clear the rope for 43. 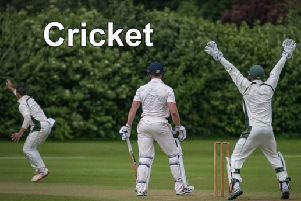 Louth continued to be positive, but wickets were falling in worsening conditions, with the umpires deeming it safe despite one batsman being forced off injured after slipping over. Louth fell short on 184-7, and travel to rivals Cleethorpes on Saturday. * The First XI were well beaten at Lincs ECB Premier leaders Bracebridge Heath on Saturday. Having won the toss, Louth bowled out the home side for 239, with Paul Martin taking 4 for 54, Seb Darke picking up three wickets and Josh Court taking 2 for 57. But in reply, the visitors had no answer to the pace of Alex Willerton (4 for 29) and Joseph Price (5 for 38), slipping to 43-7 on their way to being bowled out for 70 inside 27 overs. Xander Pitchers top-scored for Louth with 15, with Court (12), Graham West and Steven Sandy (11) the only others to reach double figures. The defeat leaves Louth in ninth place ahead of their home match with fourth-placed Woodhall Spa on Saturday (noon).